Nose: Raisins, prunes, spicy fruit rolls, plums, mixed berry jam. Dark and rich with a hint of sweet spices. Palate: Basically what you get on the nose is what you get on the palate, with a boat load of black plums and some more red fruits joining the party; a hint of tart cherries showing up as well. Mouthfeel: From the nose and the palate you might be expecting a whisky with the weight of concrete, but the whisky is surprisingly not so. It’s definitely not a thin whisky, but is only what I’d describe as medium weight. There’s a slight tingle on first sip, but it is remarkably soft for its 46.7%. Finish: The finish is long, with the red berries and plum coming more to the fore – and a sweetness, and the spices continuing to hang around for an eternity. 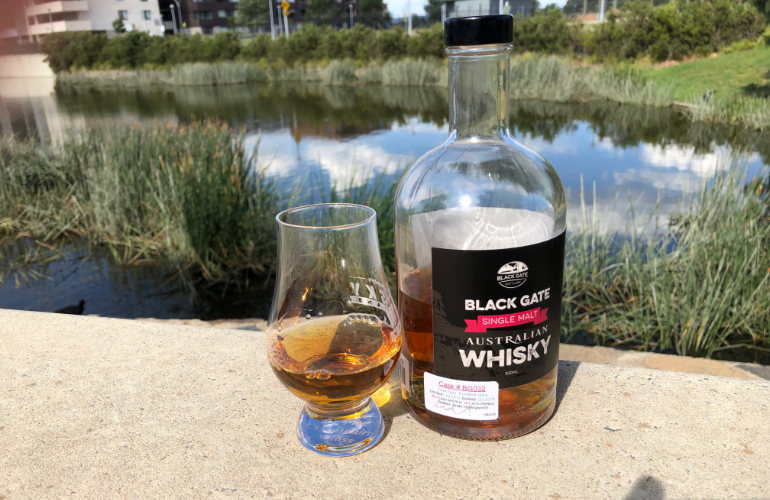 This is a single cask single malt Australian whisky from the Black Gate distillery. Bottled with no chill filtering, and no colouring, at 46.7%. Distilled in July 2015, and bottled in July 2018, having been aged entirely in a ‘hybrid cask’ made with Australian ex-tawny staves and Australian ex-red wine heads. This whisky is just dammed tasty. Tasty enough that I’ve bought seven (500ml) bottles of it, and five months after its release I’ve just about emptied the first four of them. I may not have a panama hat, crazy eyes, or a book to sell – so my musings may not get global news coverage; but this is definitely my whisky of the year for 2018. There’s been some cracking whiskies this year from Australia, Scotland, Ireland, France, and the US, that I’ve had the pleasure of drinking – but this one tops my list. The Black Gate distillery is is run by the husband & wife duo of Brian and Genise Hollingworth. The distillery is located in the Central West region of New South Wales, in the town of Mendooran – which is approximately 45 minutes north of Dubbo by road, about 6 hours north of Canberra by road, and about 5 hours north-west of Sydney by road. I visited the distillery earlier this year with some good friends for a weekend away – and if you find yourself in NSW with a weekend to spare, Brian and Genise put on a truly magical experience. Whilst there we all tried several casks that have yet to compete their slumber – and as good as this, and other recent releases have been; their best is yet to come IMO. There are some truly great whiskies (and rums) to come from Black Gate, including a second Hybrid Cask. Do yourself a favour, and buy a bottle when they are released – I sincerely doubt you’ll be disappointed.